Thank goodness for your love of organization and planning. One of the many benefits of our friendship is that as I watch the processes you use to organize all the things you do and want to do, I learn ways in which I can benefit by adding some of that into my own life. Should your various vocations and avocations bore you (or, more likely, exhaust you) at some point, you can always hire yourself out as a Life Coach and Organizer. I will happily be your first test client, but I warn you that it will require live-in help and will probably take 6 months to a year. So clear your schedule and prepare to move to California for a bit. Shall I pencil you in for 2014? And speaking of organizing, congratulations on the brilliant launch of Plan • Create • Succeed. You’ve done a great job of getting it all going and I enjoy reading it every day. It’s a wonderful way to share what you love to help others. Last time, I asked you about motivating yourself when you are not feeling creative, and I read your reply to demonstrate that you keep yourself on task by monitoring your steps toward a goal. It sounds to me like the measuring of steps, and watching your progress toward the goal, is as satisfying to you as the creativity itself – which is quite clever, really – to merge two passions and use one to spur progress in the other. It is the very essence of Plan • Create • Succeed. I am of a different mind. I admire your method, and can see it works quite well for you. But maybe the difference is that we have different goals in mind. That’s an important concept, isn’t it? Identifying and naming one’s creative goals. (Dear readers, please feel free to comment and talk about whether you have specific creative goals, and what they are! I will be interested to hear!) At present, my creative goals are simple, and relatively general: 1. To do something creative every day; 2. To let the creative piece of my day feel fun and happy; and 3. To keep learning and trying new things. There have been times in my life where my creative goals have been very specific. To make X number of pieces. To submit work to a particular show. To create something for a specific purpose. And I’m sure there will be that time again. Right now, though, I’m in the process of creating a new structure for my life. My family structure is changing, and I’m looking for a new place to live. The goals at the forefront of my mind and heart have to do with creating a new home, shaping a new life grounded on peacefulness and contentment, and envisioning how all of that will happen. The creative part of my life right now is a refuge, and taking on obligations and deadlines around it – even while at other times they’d be good motivators – just feels like too much to handle. So for now, creativity isn’t about goals. It’s about a mental haven. Maybe our different styles boil down to this simplistic description: I am more process-driven and you are more result-driven. What do you think of that? Either primary motivator requires the other to actually achieve anything – process is nothing if it never gets a result (hm, thinking about the UFOs in my closet) and result cannot be good if the process does not serve the result in terms of quality and technique and care. Meanwhile, you know I share your love of Filofaxes and I am using them to organize other aspects of my life. And you know, I’ve enjoyed using these great planning tools AND personalizing them with pretty dividers and art and words that motivate me. I showed you the Fiber Art filofax I set up here. I agree with you that having a tool that is pretty and feels good, even luxurious, can make something ordinary into something almost celebratory. It’s like using a favorite mug to drink tea – the feel of the mug, the memory of where you bought it or who gave it to you, the pleasant feel of the ceramic texture, etc – it all goes into making using it part of the enjoyable experience. My Great Beast of a Bernina, as you call her, does in part do that for me. But there’s something more – getting that machine was an investment in myself, in a way – recognizing how important the sewing I do is to me, letting myself have a tool that would do anything I could possibly every want to do (and then some) ... So it is both the tool itself and what it symbolizes to me. It is an investment akin to your investing in yourself and what you do by building your studios. 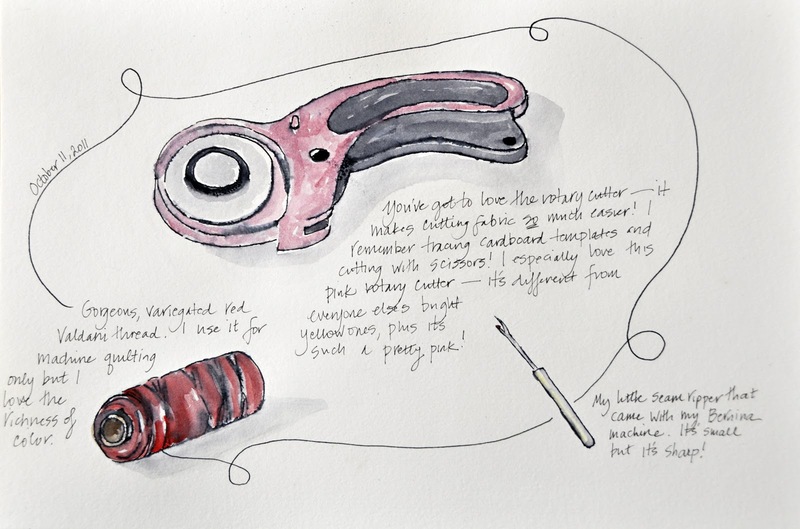 I love the idea of drawing the items of junk that come out of your soon-to-be wet studio. I am finding that doing a bit of drawing and painting every day is becoming tremendously important to me. I think it is the closest I have ever come to achieving the kind of “empty mind” one is supposed to have in meditation. All thoughts and worries are let go, and I absorb myself in looking at the lines and shapes and shadows of what I am trying to draw. I’ve found that it’s a way for me to instantly access a bit of serenity. So I now carry around a plastic pouch that contains a 5x7 sketchbook filled with watercolor paper pages, a small watercolor kit, a few pencils and pens, and some waterbrushes (WHAT a great invention those are.) And even if I’m having a busy day, I allow myself the pleasure of drawing something somewhere along the way. It not only focuses my mind and gives me my own portable oasis; it also does make me see things differently. The other day, for example, I had a series of appointments that took me to an area I didn't know well. 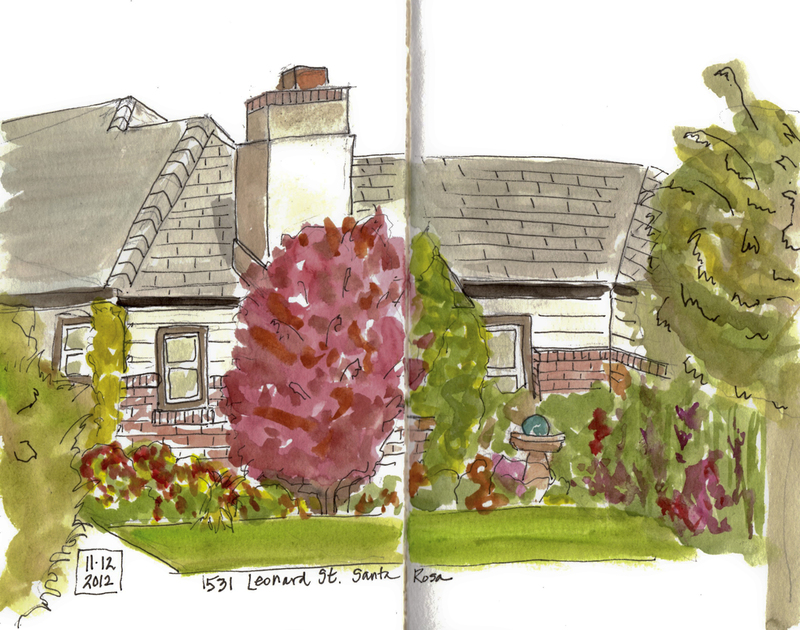 On the way, I drove down a street of charming houses, and after my appointment, I went back to the street, parked for 30 minutes, and did a quick sketch/painting of one of the front gardens. That's the drawing above. It isn't great. But the experience of doing it was lovely and now when I look at it, I remember that quiet, calm sense I felt while I was doing it. Eventually, maybe this drawing and seeing will show up in my fabric art as Terry suggests. But I’m getting a lot of satisfaction from seeing my drawing and painting improve. 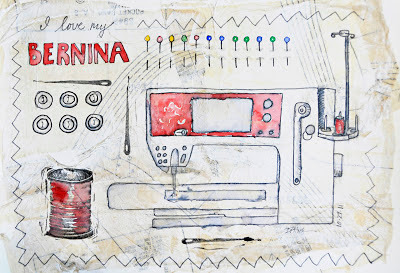 Your mentioning my Bernina and your thinking about drawing that junk in your storage room makes me think of a different suggestion: draw the tools that you use in your art. Draw your filofax. 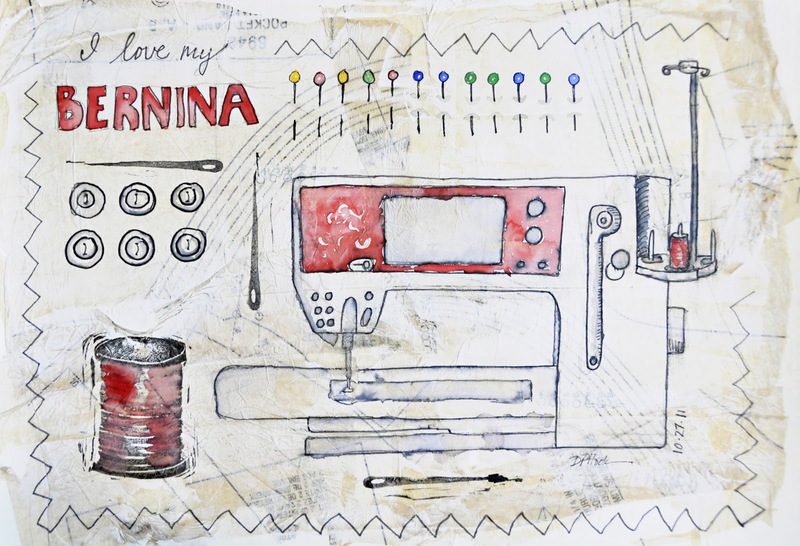 Draw your sewing machine. Unless you are specifically wanting to memorialize the stuff coming out of the room (which seems like drawing for a backwards reason, if you know what I mean), why not draw for a forwards reason? 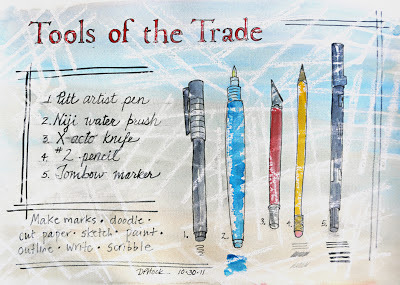 Draw the things you use and intend to use. As you see above, I've done my sewing machine (on a page that was collaged with old sewing pattern pieces). I've drawn some of my sewing tools. I've drawn my drawing tools. There's something very satisfying about that. I highly recommend it. 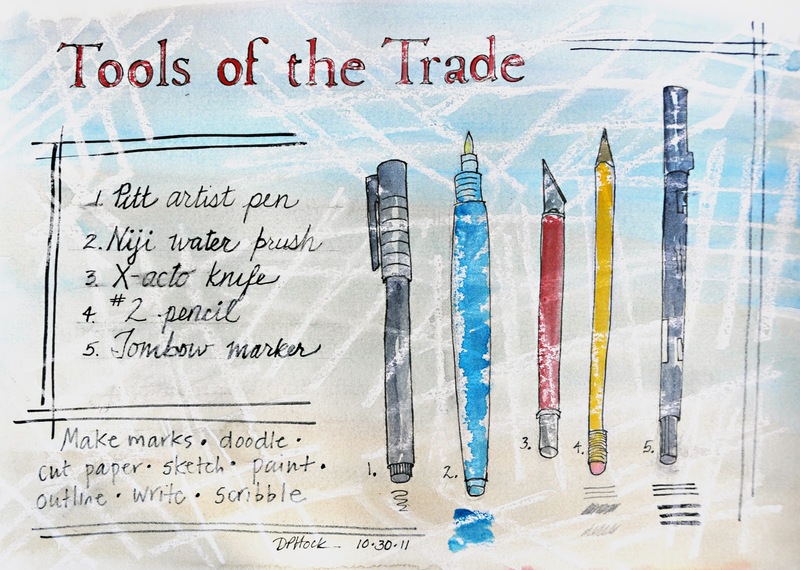 After all, if you are going to spend time drawing, why not draw things that important to your present and future, as opposed to the junk you are pulling out of the room on the way to your new wet studio? 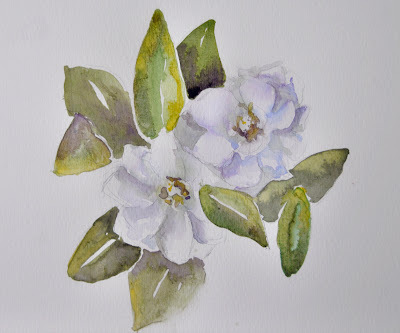 And I’ve been participating in some online classes (I do love Joggles.com) which are exposing me to different ways of working with and understanding watercolor paints. 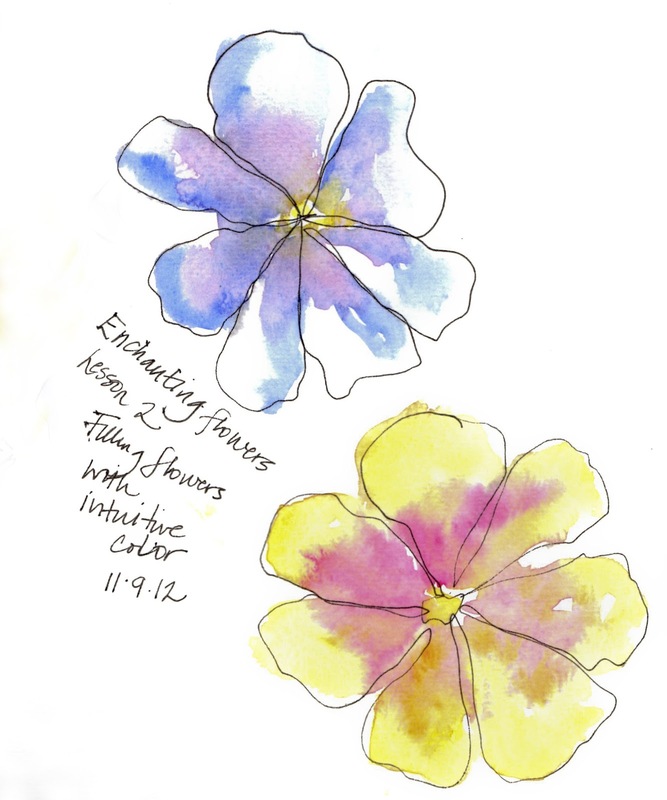 One class, from Sandy Holzman, has been about exploring magic of what watercolor paints will do and just using them “intuitively” to see what they do. It’s a different approach than I’ve ever taken, and it’s been surprisingly difficult – my biggest issue is how hard it is to just LET THINGS BE, let them dry, don't keep poking at them and trying to add more. 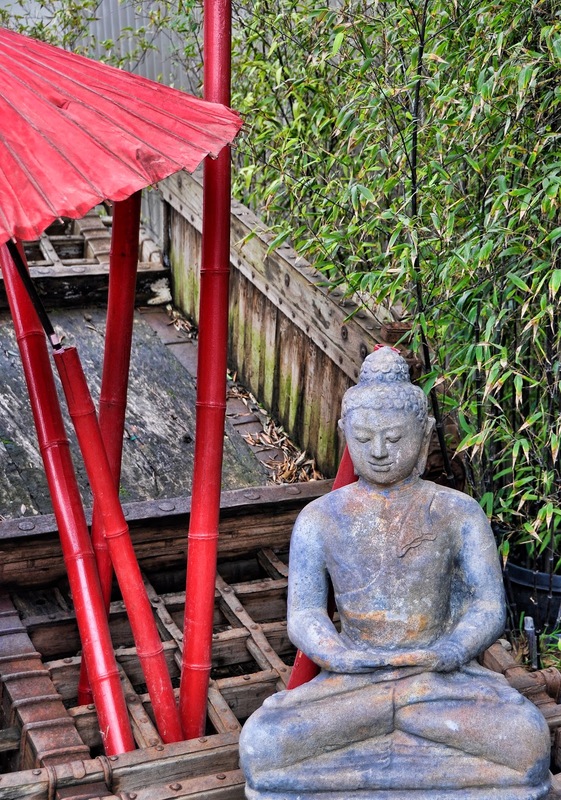 So there is a zen-like lesson here – be patient, let the paints do what they will. Doing too much often makes things less clear. It is not the most comfortable process for me, and the results are iffy. But it's the trying that I'm loving. 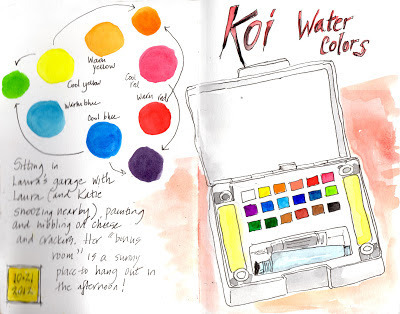 Perhaps when I get through my family upheaval, I can write a book called “Everything I Needed to Know About Life I Learned from my Watercolors.” But I have to finish learning it all first. Before I close, I want to comment on your wondering why cafes are special places for fostering creativity. Maybe it's not the same for everyone, but you know I agree. I think it might be that, in our respective day to day lives, other settings are imbued with different purposes, more mundane business, chores, and interruptions from well meaning family members who unerringly can interrupt at the worst possible times. I think there's something about sitting in a corner of a cafe -- with nice food and beverage smells wafting about, a pleasant bustle of people, a sense of being alone but in a social setting, and a place where a glance in any direction doesn't conjure up "oh, there's dust there, I must clean that". It's a place of relaxed well-being. So there is room to let the right brain wander. I love our virtual tea-and-talk cafe, though. I'm going to go refresh my tea now. I just wanted to pop in to say how much I enjoy this new set of watercolors. I loved the 12 x20 of your "tools" and, at first, thought the Bernina was also fabric. I carry a cheap $10 (art sketchbook) journal around with me. I LOVE the pages, the way they feel, the way my pens slide across as I write. The way my gluestick is applied. I can gesso the pages in black or white and then draw on top of that with chalk pens. No ripples. Always smooth. I write, glue, draw and list in these journals, things as mundane as a list of what I ate that day. Last time at the art supply I bought 10. I fill about one a year as there are so many pages and I skip writing for days at a time. It's right here my my left elbow. I would be lost without it. I can go back and look in old journals and find missing recipes, phone numbers and best of all, memories. I imagine myself, in my 80's or 90's reading my life out of these journals. What a lovely thought. My journals are a little like yours Joanne, mixtures of thoughts, ideas and lists. I also keep all my workbooks (which are essentially my to do / done lists plus daily jottings, phone messages etc. They are the minutiae of my life which is very ordinary, but the very ordinary is rarely recorded in favour of the great and the good. In terms of creativity though I doodle a bit, I write notes but as I writer I prefer to get stuck in. I am not a great planner. I have a basic idea and then I let the book / story get on with it. There are precious few notes for my books.